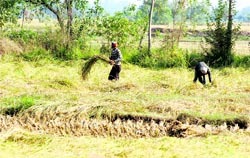 Even as the Select Committee of the Legislative Assembly is yet to submit its report on the Bill which was tabled in the Budget Session to prohibit the conversion of agricultural land for non-agriculture purposes, the state government has already started a campaign to educate the people not to use or sell their agricultural land for other purposes. Come winter, packets of dry vegetables and dry fish dot Jammu markets to suit the tastes of consumers who cherish them with elegance. The Jammu and Kashmir Government has declared 41 heritage sites as state protected monuments and said several other sites in the state are in the process of being put in that category. This was decided at the first meeting of JK Conservation and Preservation Authority held under the chairmanship of Minister of Tourism N R Jora here yesterday. The Jammu and Kashmir government will start work on the Rs 45-crore prestigious ropeway project between Mubarak Mandi and Mahamaya Park by June next year. This was announced by Minister for Tourism and Culture Nawang Rigzin Jora at a high-level meeting chaired by him to review the progress made in completing the paper work for initiating the project. Chief Minister Omar Abdullah has expressed grief over the death of the mother of his former Principal Secretary and Union Joint Secretary Information and Broadcasting Khurshid Ahmad Ganai who passed away at her native village in South Kashmir recently. While the seat of the government has shifted to the winter capital of Jammu, there has been a little respite in traffic congestions in the civil lines area of the city. Minister for Forest and Environment Mian Altaf Ahmad has said the menace of timber smuggling and encroachment of forest land in the Valley had been curbed with iron hand and measures were under way to rejuvenate the forest cover of the state. Addressing a press conference here recently, the Minister said by the concerted efforts of the Forest Department, there was no complaint of any timber smuggling or encroachment of forestland. Once upon a time there was more stress on the correct spellings of English words, even as English medium schools were not so common. But with the increasing number of such schools side-by-side with government schools all across, least care is being taken of the correctness of spellings. Credit, perhaps, goes to the ever-increasing number of computer-savvy students and other experts, as there is automatic correction of spelling mistakes. Chief Minister Omar Abdullah said here recently that there was a need for the introduction of market-oriented courses in higher education institutions for expanding job market for students. Minister of Agriculture Ghulam Hassan Mir, while addressing a function at Jammu recently, emphasised on aggressively launching this campaign to increase the agricultural produce in state. Due to lack of consensus among various political parties, the Legislative Assembly in the Budget Session referred the Bill to prohibit the conversion of agricultural land for non-agricultural purposes to the Select Committee. The proposed law provides complete ban on the conversion and alienation of agricultural land except with the written permission which according to the Bill may be granted to the extent of 2 kanals for residential, commercial, industrial and public utility purposes. Mir, while addressing a one-day seminar on “Land Resources Conservation”, said growing population was a major threat to the land and water resources of the state and called for micro planning for the conservation of landmass and water resources of the state to safeguard the future. He said agriculture universities of the state had greater role in the conservation of landmass resources by taking technology to the field for increasing the per-hectare production. He said due to small landholdings and less productivity, people did not take much interest in farming activities. He said interest could be restored by increasing the production and making agriculture a profitable activity and this could be done only by researchers and scientists. He said this would definitely halt the distress land sale by the farmers. Mir said: “Our main thrust should be to stop the conversion of irrigated agricultural land to non-agriculture purposes”, adding that the government had already brought a Bill in the last Assembly Session for a ban on the change of use of irrigated agricultural land. He called upon civil society of the state to come forward and support the initiatives of the government in this regard which was pivotal for safeguarding the future of the state. Referring to the rain-fed areas of the state, the Minister said the state needed a comprehensive planning for the conservation of rainwater during spring in Kashmir and monsoon season in Jammu. He said the move would greatly help in extending the irrigation facilities to the uncovered areas. He added that the conservation of rainwater had proved highly beneficial and the state was vigorously pursuing a mission project with the Centre in this regard. These packets come here from the Kashmir valley in winter months despite the availability of green, leafy and fresh vegetables in abundance in the region all through the year. The consumers mainly are Kashmiri Pandits, who despite having remained away from the Valley for the past over two decades, have not abandoned their age-old taste for dry vegetables, particularly if they carry a tag of having been cultivated on the Kashmir soil. A good number of Kashmiri-origin Darbar Move employees, who work here from November to April every year, equally cherish dry fish and dry vegetables ranging from tomatoes, turnips, brinjals, etc. Mohammad Shaban Parray, who hails from Mirgund, Kashmir, and sells dry vegetables among the Kashmiri Pandits and the employees of the Darbar Move here, said scores of such growers like him visited the winter capital every year to sell packets of dry vegetables to the retailers in the areas like Subash Nagar, Chinnore, Talab Tillo, Sarwal, Bantalab, Bohri, Janipur and Panjtirthi. Shaban said vegetable growers collected these vegetables in their native villages from August to October. “After slicing them, vegetables are dried in sun and then packed,’’ he said. A similar kind of exercise is conducted to sell dry fish after collecting it from fishermen of the Valley. Ismail, another vegetable and fish seller, said, “Since Kashmiris are emotionally linked to their homeland, they cherish dry vegetables and dry fish. “It fetches us a good business,’’ he added. Anil Raina, a migrant putting up in Jhiri Camp, said even his relatives putting up in technology-advanced cities like Bangalore and Hyderabad consumed the dry vegetables from Kashmir with an element of pride and nostalgia. Kamla Wati, a housewife, said cooking of dry vegetables was an art in itself. “What is important is the real combination of dry vegetables, nowadays called the synergy of foods,’’ she said. The Darbar Move employees staying in Panjtirthi locality near the police control room here said they cooked together dry tomatoes and dry fish called "hoggard" in Kashmiri. however, forbid its frequent use, claiming that such stuff could be a health hazard. “Dry vegetables are prone to degeneration and a breeding-ground for germs,” Dr Shariq said. Kashmiris, who used to remain land-locked for more than six months a year, had been consuming dry vegetables since ages. Even when they get fresh vegetables round the year, they have not stopped using a variety of over and underground vegetables, including dry green and wild leaves in the shape of "hund", "haakh", "vapal haakh" and "bume". It was decided that all heritage sites would be listed and graded for conservation in all three regions of the state to promote tourism. The proposed ropeway would add another tourist attraction to the city of temples. The meeting discussed issues like forest, wildlife and environmental clearance, besides compensation to land owners and transfer of JDA land to the Cable Car Corporation. Despite the little movement of tourists to the Kashmir valley during the winter months ahead, steps are being taken to regulate traffic movement on the Srinagar-Jammu National Highway, the only surface link connecting Kashmir with the rest of the country. The 300-km-long highway witnesses heavy movement of traffic in view of the civil secretariat and other state government offices working from Jammu for six months. In order to regulate the traffic movement on the highway, joint control rooms are being set up at Qazigund, Jawahar Tunnel and Banihal with representatives from Beacon, Police, Traffic, Army, CRPF and Civil Administration to counter any traffic snarls on the Srinagar-Jammu National Highway during winters. The decision was taken in a meeting held at the Beacon Headquarters at Rangret, which was chaired by chief engineer Project Beacon Brigadier TPS Rawat. Management & OSD with Divisional Commissioner, Kashmir, Aamir Ali. The Beacon was represented by director, Planning, Col N. Chauhan, PRO Lt-Col CST Swamy, executive engineer SK Singh and officiating Commander TF, Maj P Mukherjee, OC RCC and DK Bohra, Officer I/c Tunnel. It was decided that proper communication facilities, including wireless sets, would be provided to the officials manning the traffic on both sides of Jawahar Tunnel. It was also decided that in case of adverse weather forecast, the traffic police would restrict movement of traffic on the national highway, as a precautionary measure. The Traffic Department will start a media campaign to make people aware of the traffic rules. Minister for Forest and Environment Mian Altaf Ahmad has said the menace of timber smuggling and encroachment of forest land in the Valley had been curbed with iron hand and measures were under way to rejuvenate the forest cover of the state. Addressing a press conference here recently, the Minister said by the concerted efforts of the Forest Department, there was no complaint of any timber smuggling or encroachment of forestland. He said during the past few years, smuggling had posed a great threat to the forests in the Valley, mostly in the Budgam, Shopian, Langate and Ganderbal areas, and the department had seized 61 vehicles and 882 horses that were involved in illicit timber smuggling during 2008. The number had decreased to 24 vehicles and 290 horses during 2010-11. Mian Altaf said the government had launched a new scheme named CAMPA under which the deforested areas was being channelled, fenced and afforested to augment forest cover. He said the department had adopted traditional plantation drive and for the first time, new nurseries of Deodar, Kail were being developed in which 30 lakh saplings were raised by the department and likewise 6 lakh same saplings were being provided to farmers for plantation this year. 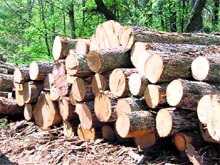 Referring to the supply of timber to consumers, the minister said there was a target to supply 13 lakh Cft during the current financial year, while during the past three years, the department had distributed 9.98 lakh Cft, 10.59 lakh Cft and 11.49 lakh Cft with fair and transparent manner among the bonafide consumers through 662 forest timber sale depots. Altaf, however, clarified that the inaccessible areas lacking connectivity and sale depot facility, timber was being provided directly from the forests out of dry and fallen trees. Referring to the man-animal conflict, the minister said all possible efforts were being made to lessen such incidents in future, however, he stressed for more public awareness in this behalf. The minister said the government had started work on eco-tourism under which various scenic and beautiful places in forest areas were being developed without any harm to ecology and environment. He said Dehra Ki Gali in Poonch, Bungus in Kupwara, Bhaderwah and various sites along the Mughal Road area were being developed in first instance. Once upon a time there was more stress on the correct spellings of English words, even as English medium schools were not so common. But with the increasing number of such schools side-by-side with government schools all across, least care is being taken of the correctness of spellings. Credit, perhaps, goes to the ever-increasing number of computer-savvy students and other experts, as there is automatic correction of spelling mistakes. There is no need to learn by heart the spellings of the most commonly used language. While the development works have been going on by way of widening of roads, refurbishing of footpaths, which are getting narrower in the capital city, erection of barricades and fencing along road dividers, the use of various signboards is also necessitated. The common use of signboards indicating the location of an educational institution and, thereby, tending the drivers to slow down for the safety of students, has now been added with a written inscription. One such inscription in the heart of the city (see photo) catches everybody's eye, be it the driver or the pedestrian. The signboard along the newly-built road divider in front of Women's College on the MA road catches everyone’s attention. Though many educational institutions are located around, no one has the courage to change the spelling displayed on the signboard from "Collage" to "College". Other educational institutions around include Sri Pratap College, College of Education and SP Higher Secondary School. As the day and night temperatures keep on declining in the Kashmir valley reminding of the chilly winter months full of snow and freezing cold, most of the people prefer to be home by the evening. But for many, who come to the Valley from various parts of the state, have to face the problem of lack of public transport during the evening hours. The passenger transport in the capital city is mostly off by the evening and many people are seen waiting in the biting cold for the public transport. It is time for the authorities concerned to ensure that the commuters do not face any difficulty on account of the lack of transport facilities during the evening hours. "Instead of offering courses in the traditional streams, the universities should go for introduction of subjects of modern market utility so that students completing their studies are comfortably absorbed in the job market,” he said while chairing a review meeting of Baba Ghulam Shah Badshah University here.